OK!...Dollygirl and Dleelaw are two judges. Not much required but to just look and maybe comment. No rules this month, so it's just too easy. I will need for you two to pick three winners and two Hms when the time comes...pm me with them. I am so proud of you two, stepping up to help. I am going to send both of you the entire gift package and you don't have to enter! How's that for appreciation. Thanks. Well dang! Music. Thank you. This is way to generous but I am going to take my goodies and run! I'll be back on the first with my picks. 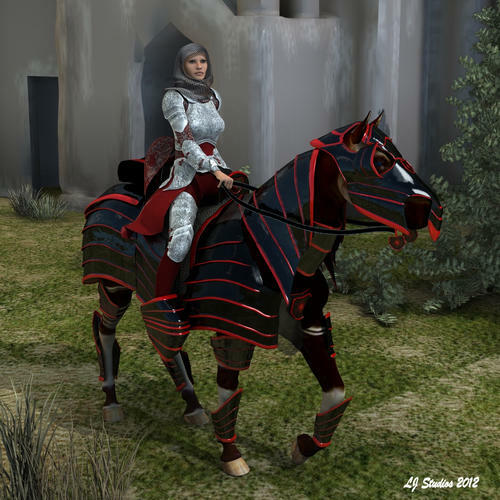 And here is a peak at the red and black armour rendered in DAZStudio4.5. Isn't it purtty? Mongloid did a beautiful job. Now to get the Poser sets done. Jeeperz, try IZArc I use it, it's not shareware, it's freeware (there is a difference) and it even does 7Zip files, and has several encryption formats if you need that for some reason. It will read and also write many of the most popular archive formats. Another render to thank the prize donors for all the great stuff! V4 Reda in her Riding Suit moves into her Basic Room, complete with an English Bookcase (ALL stuff by Music4u2u), to find it already decked out for Halloween. And, in the background, some of the structures from Building Sidewalk, another gift from Music4u2u! As a long time lover of all of the Universal Horror/SF films (including those of A&C), this is probably the funniest (if not the sliest) parody I've seen in a while! Can Frank Einstein Wolfs the Meat Man be far behind? Do yo happen to be on Windows Vista or Windows 7? If so, are you sure you are not logged in to the administrator account? Or...perhaps you have a drive full, or with a bad sector. Or maybe the archiver is being installed where it can't run, a protected folder. I'm still on Windows XP Pro, so I'm just throwing out some ideas that I've seen people talk about. Just noticed you said you don't have access to download...does that mean you can't even download IZArc to your computer? This sounds like the administrator account issue. Or you're trying to download to a folder that has been protected or made read only. Try downloading to your desktop. Or maybe I'm not understanding you. Hey, that's a funny one! I like it. 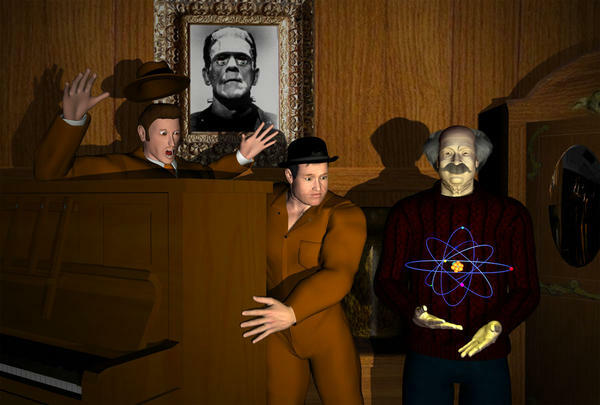 I like the eyes on the Frankenstein photo bugging out like that! And I haven't seen an Abbot and Costello flic in a while, but it seems you got pretty good likenesses there! And you're welcome. When I started in 3D (DS 0.8 or 0.9 or something: one of the betas) I was frustrated that skins weren't interchangeable between figures, and even those that were (Gen3 and copycats at the time) had to be applied by hand. Thus the larger MAT file size for the Albino: I had to make room for everybody's material zones. Feel free to use it as a base MAT for any Gen3 skins you want to. Nice job getting Einstein's hair to slick down. Must be before that Manhattan thing. All links check good accept the piano. Her page is there, but none of the downloads work. 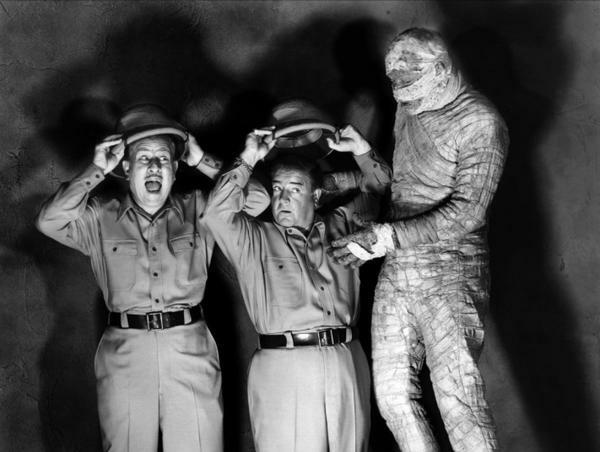 Thanks, everyone, for the comments on my Abbott & Costello entry. Eustace -- Well spotted on the dud download at Henriette's site. Thank you too. Shifted that item to the "Also Used" bin in my original post. I gotta meet this music2u4u guy.....huh?......oh.....nevermind! Love the eyes on Frankie's pic! I have that movie in my A&C collection. I also have the mummy one too. I can feel it... the Power. Phenomenal Cosmic POWER!!! POOOOWWWWEEEERRRRR!!!! Just too darn funny Kal...even the clouds are rockin'...everything is good...perfect entry. I appear to possibly be about to find out if the ranking changes again at 5000, not certain how that happened. Heh. I don't see how those who are at that number of posts (and who are not mods) do it. I feel as if I'm already too "involved" at the level I'm at. In the words of the Great Edna: "Yes, words are useless! Gobble-gobble-gobble-gobble-gobble! Too much of it, darling, too much! That is why I show you my work!" Well there is a variation in those who have gained addict status. 4 are Mods and Jade is a CV, and a very helpful one, so he at least does have a reason for posting that much. BTW 5000 posts didn't change anything, I am still a Bryce Addict.